Made from the finest Italian silk scarves in beautiful prints. 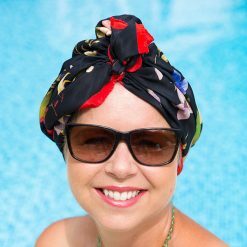 An elasticated circle at the front allows you to thread the 2 back panels through creating a stunning turban quickly & easily (after first knotting them at nape of neck to secure tight fit). Create different looks by pulling the 2 ends through the elasticated front circle and either tying in a knot to give extra height and a dramatic effect or simply crossing over and tucking back in for a neater, more sophisticated look. 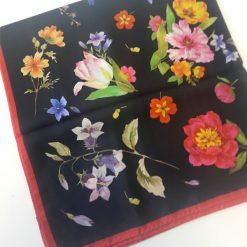 You can really play with the colourful edging of these scarves, either leaving them to frame the face or tucking them away for a plainer look. This turban scarf style adds height and fullness to your face and and sits low at the nape of your neck.